First Horse on a good day. An epiphany is a moment of cosmic harmony. The sudden realization that you are at one with the universe. A reverse epiphany is when you finally admit that the elephant is not only in the room but that tapping sound is the trunk whacking you repeatedly and vigorously. It is the death of denial. I had one on my last cross-country trip with my first horse. First Horse had looks, movement, jump (see photo), and absolutely no desire to press the envelope. Although he could jump 3’6″ courses, his comfort zone stopped around 3 feet. If Adult Hunters had existed, he would have been fabulous. 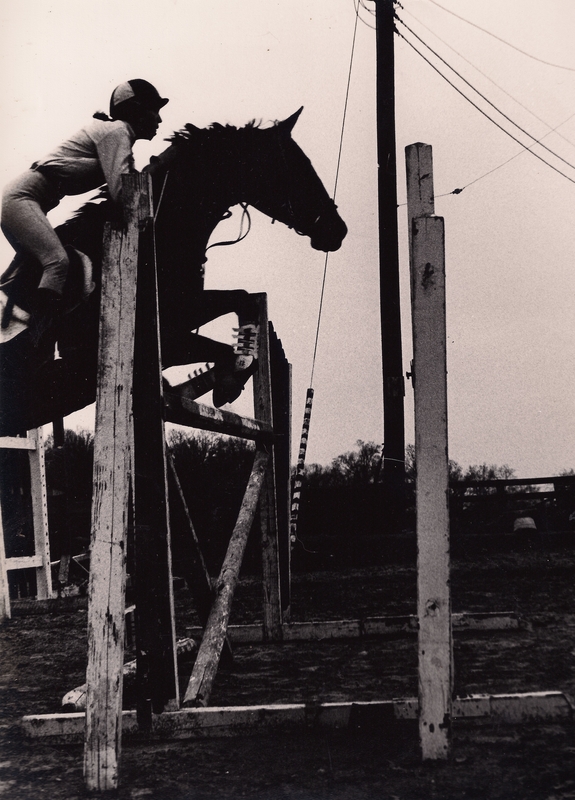 We were riding at Training level in Eventing and Schooling in Jumpers. I was still under the delusion that horses could be taught to event. HA! We would have just enough success to entice me to continue the head to wall festivities. If I had to do it over again, well, I would have bought a different horse. Short of that, I would have dropped us back to Baby Novice until he was more comfortable. But a) BN had just started up. It was very much a division for kids & ponies. Adults didn’t do it. Even more so, b) I was caught up in the Eventers Never Quit mentality. To go back was to admit defeat. In hindsight, I see the silliness. At the time, I was thinking kick on, kick on. Among the many things FH didn’t like was jumping into water. Because of this, he was actually quite good in the jumper ring about going *over* water. If it meant getting his feet wet, No thank you. The centerpiece at our final event was a large lake. The start box pointed straight at it. We weren’t jumping into it. Our course skirted the edge. FH did not know this. He saw a body of water in front of him and pitched a freaking fit. I had punched my wrist timer, so I know for a fact that he spent 20 seconds on his hind legs after the word Go. You can imagine how the rest of the course went. We were finally eliminated. (Which reminds me of a story, more tomorrow.) I walked off the course, tears pouring down my face. I was heartbroken. This was my first horse. It was time to admit that it was not working out. I was boarding, therefore unable to accumulate pasture ornaments. I sold him shortly thereafter. I can still feel the moment of realizing that my world sucked. That it had sucked for a while. That it was time to recognize the elephant. Ideally, I’d ask for your reverse epiphanies, but I have enough hopeless moments of my own. Instead, what is the most colorful horse you have ridden? Great Essay! Sorry for your pain, but it does make for good reading.